In our Monkey Business series, we sit down with creative internal communications pros, employer brand experts, HR top-performers and email gurus to get the best tips and tricks to engage employees, fix your culture, and help you improve business performance. In recent years, with the rise of digital media, the importance of creating, maintaining and sustaining a stellar employer brand has increased significantly. It is now vital for companies to showcase an authentic employer brand, in order to attract and retain top talent. When it comes to developing a strong and consistent employer brand, it’s crucial to ensure that employee engagement remains high as well. This then ensures your employees are actively promoting your employer brand as advocates. “Employee engagement is top of mind for leaders and HR professionals. Low employee engagement is not for a lack of effort and commitment from leadership and HR. The biggest challenges related to employee engagement are a lack of data and poor communications,” says Ashley Mayhew, Employer Brand Consultant at LinkedIn. After graduating with a Masters of Industrial Relations and Human Resources from the University of Toronto, Ashley dove headfirst into the tech start-up world before moving to work in internal communications for one of the largest banks in North America. She now works as an Employer Brand Consultant for LinkedIn. With this diverse range of experience, Ashley has become a leader in the Employer and Talent Brand space. Specializing in online branding, marketing and social media strategy, Ashley is passionate about developing company brands through ambassadorship and employee storytelling. We recently had the chance to interview her to discuss the role of employer branding, the importance of employee engagement and the key components required to build a solid employer brand for your company. Disclaimer: The opinions expressed in this article are those of the author and do not necessarily reflect the views of her employer. 1) How would you define employer branding? Why do you think it’s something that’s becoming increasingly important in today’s world of digitization? This is more of a top down brand approach – how organizational leaders and communications specialists answer “Why work here”? On the flip side, from an employee perspective, a company’s talent brand consists of the true experiences and perceptions of former, current employees and candidates. Managing your employer brand is more important than ever for many reasons. First, the future success of an organization heavily depends on the productivity and skills of their employees, especially their top talent. Second, global competitors are investing more time and resources into building their brand. Third it’s a passive candidate market at the moment. Highly skilled people (especially in niche markets) aren’t urgently looking for jobs and unemployment rates are relatively low. Finally, in the age of digitization – two-way, real-time feedback and rating apps further challenge organizations to deliver on their value proposition and share authentic messaging. Inauthenticity will be questioned by employees and potential candidates, which can be brand-damaging. This emphasizes the importance of having a great employee and candidate experience. 2) Tell us about your career journey. You started off in marketing and moved on towards roles that were increasingly focused on employee engagement and employee experience. What captivated you about the employee experience? I have always been extremely passionate about communications and the power of storytelling so any role in an organization that required those skills interested me. Marketers have been using customer journey mapping and brand experiences for years – so the pivot from B2B marketing to recruitment marketing was a fluid transition for me. Much of my success in building Employer Brand Strategies is based on leveraging marketing tools as the foundational strategies & tactics marketers have used for years. After working with the Talent Acquisition team, I was exposed to opportunities to work on TD’s Employer Brand strategy and eventually became interested in the power of authentic storytelling. This is when I became impassioned with the deeper relationship of Employer Brand and Employee Experience. I truly believe that the success of organizations depends on the people they hire and how well employees are treated because ultimately this translates into motivation. Good people who are treated well, are extremely motivated and extremely productive. And productivity is a key differentiator of an organization’s success. If you think of it that way, building a great employee experience is not only very exciting, but it is extremely powerful! 3) What advice would you give to someone aspiring to take on a role within internal communications and/or employer branding? What skills do they need to hone and master? Data analytics – although it sounds counter intuitive for a creative communications role, it is the most important skill to master. Data and insights should determine the channels of communication you use, define the content you create and how you track your success! This is why it is extremely important to work closely with the HR team that conducts the employee engagement survey and ensure you gather feedback from employees to best understand what they want to hear, who they want to hear from and use the channels they prefer. 4) Let’s talk about employee engagement. According to Gallup, only 13% of employees are engaged globally. How can companies change this? Employee engagement is top of mind for leaders and HR professionals-. Although many organizations conduct point-in-time engagement surveys once a year, the results of these surveys often do not uncover the real pain points in an employee’s day-to-day. Most engagement surveys are incapable of getting those answers. In addition to the lack of data, most organizations don’t effectively circle back and tell their employees that they heard their concerns and provide tangible examples of how they are looking to improve their experience. What I love most is that every day is different in my role. Some days I am working from the cabin of a plane, traveling across Canada to visit partners and host Talent Brand Workshops. Other days, I might be bunkered down in a scrum room with my team building digital brand strategies. 8:00am: Browse social media and answer my emails. 8:30am: Commute to work via TTC. 9:00-9:30am: Huddle with my team (usually over breakfast) to sync up and identify anything we should collaborate on that day. 10:00am -11:30am: Develop a go to market strategy for a company launching their new employer brand (one of the channels being LinkedIn). 11:15am-1:00pm: Lunch! Usually meeting with Women at LinkedIn Volunteer group to plan upcoming events. 1:00-2:00pm: Review and analyze client campaigns and build KPI report. 2:00pm-5:00pm: Travel to client headquarters for a custom Employer Brand Workshop. 6) Name a book you think every employer brand consultant should read and why? Employer Brand Management: Practical Lessons from the World’s Leading Employers by Richard Mosley is a great read. It includes practical experiences and case studies of leading organizations. The author shares great insights on successful planning and implementation plans and processes. However, since Employer Brand specialist roles are still fairly new in most organizations, I think it is most beneficial to connect with others in the industry. Sharing insights, challenges, and collaborating to find solutions is extremely powerful. To meet other employer brand experts, I highly recommend attending industry workshops and events, such as LinkedIn’s Talent Connect. 7) What’s the one thing you can’t do your job without? Yoga. I know it sounds bizarre. But when I feel like I’m spinning a million plates, my “to-do-list” is totally overwhelming and I don’t know where to start – that is exactly when I need to step back and meditate. After a yoga class, which is offered at the LinkedIn office, I come back mentally refreshed, with a new perspective and a can-do attitude. 8) What are some key components for building and maintaining a strong employer brand? Is it to get an increase in hires, quality applications or generate brand awareness? The other key component for building and maintaining a strong employer brand is to have data driven insights. Identify who your target audiences are, what they care about and their current perception of you as an organization. Understand where they’re located and how best to connect with them. What internal communication channels do you want to deploy to do this? The last piece of building a strong employer brand lies in the power of authentic content that resonates with your audience. For authentic storytelling, you need to leverage internal stories and use human language that speaks to your audience, based on the insights you’ve gathered about them. One of the biggest errors in communications is communicating what you want your audience to hear, not what your audience wants to hear. Make sure what your audience cares about is top of mind. 9) Tell us about one of the best employee engagement campaigns you’ve seen another company successfully execute (or perhaps a campaign you worked on yourself)? What made it work? An employee engagement campaign I was extremely proud of was the “Very Innovative People Campaign” my team and I ran for Technology employees. The campaign was a contest, asking employees to share the innovative projects they were working on. We then filmed the winners sharing their story and the projects they worked on with emphasis on their unique career, exciting work and their passion for creating great products with the customer in mind. The success of the campaign was attributed to the team sharing authentic employee stories, leveraging the power of video, using human messaging. The content was extremely relevant, while capturing the hearts and minds of our audience. 10) Some of the people we talk to at conferences or that reach out to us have a problem getting employees to open creative internal communications — what’s an internal email you’ve received that you actually loved? What makes a good email? One of my favourite internal emails was a leader recognizing a fellow colleague. It not only was a great example of how people get informal recognition, but it also made me laugh and smile. The use of emojis can really define whether someone opens your email or not. The content continued the boxing theme asking employees to “Read the following like an announcer” and the body was written like someone was reading everything over a loudspeaker at a match. I read the whole thing as soon as I received it. 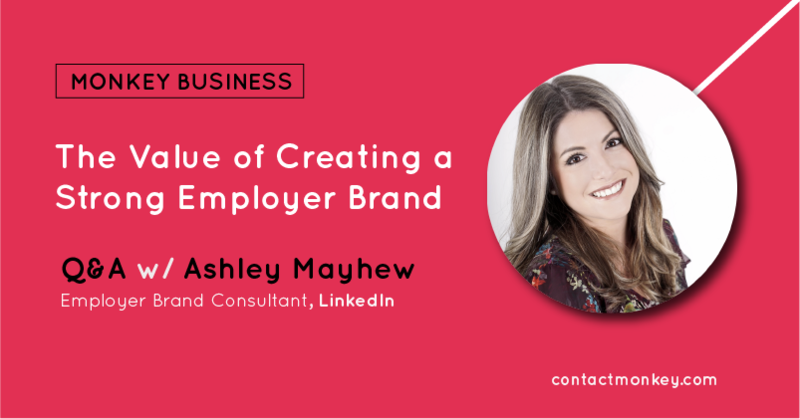 Let us know what you thought of our chat with Ashley Mayhew on the importance of developing a stellar employer brand. If you want to add to the conversation or share your internal comms tips, tweet at us with #MonkeyBusiness! Did the above article inspire you to boost employee engagement using data-driven insights? You may want to up your internal comms game by tracking your employee emails with our handy tool. Just click on the button below to book your demo!